Libya’s leader Muammar al-Gaddafi has a bright future with President Obama running America’s foreign policy if the messages to the dictator coming from the White House are trustworthy. Consider five Obama messages to Gaddafi that make our President and, by association, America appear feckless. Obama’s first message to Colonel Gaddafi is leave, then go to jail. The President said, “I am absolutely clear that it is in the interests of the United States … for Mr. Gaddafi to leave.” But then why did Obama support the United Nation’s decision to prosecute Gaddafi and his lieutenants for war crimes? Obama supported former rulers such as Egyptian President Hosni Mubarak giving up power and then heading into exile, not jail. That transition quickly defused a tense situation. But Obama wants Gaddafi turned over to the International Criminal Court to face prosecution. Facing certain prosecution for war crimes may well be the reason Gaddafi chose to battle his own people instead of seeking exile. Obama’s second message to Gaddafi is that the UN’s arms embargo applies to both the dictator and the rebels alike. Two weeks ago, the UN imposed an arms embargo with Washington’s support designed to weaken Gaddafi by preventing him from acquiring weapons. But then the U.S. State Department realized the same embargo prohibits shipments of defensive arms to the rebels too. This act has the unintended consequence of guaranteeing Gaddafi’s well-armed forces will win against the ill-equipped rebels. Now Obama is trying to amend the embargo to allow for arming the rebels. Doesn’t Team Obama remember a similar situation in 1991? At that time the UN imposed an arms embargo on the former Yugoslavia, but that act helped the well-armed President Slobodan Milosevic unleash wars against lightly armed Bosnia and Croatia, leaving a quarter of a million people dead. Donilon’s contrary multidimensional assessment places considerable reliance on the impact of UN sanctions and seizing $30 billion in Gaddafi’s assets. 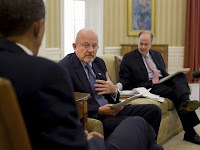 But the Libyan has more than enough arms and money to outlast the rebels, which explains Clapper’s assessment. Gaddafi reportedly has “tens of billions” in cash in Tripoli, allowing him to prolong his fight, according to the New York Times. He also has hidden funds under the names of family members and close associates and continues to pump 400,000 barrels of oil at $100 per barrel each day. Obama’s fourth message to Gaddafi is the U.S. isn’t likely to become militarily involved in Libya. Secretary of Defense Robert Gates warned about the dangers of American military involvement, unless it is authorized by the UN. He said “a no-fly zone [something the Libyan rebels, allies such as France, and the Arab League support] begins with an attack on Libya to destroy the air defenses,” which would make the U.S. party to the conflict. Last week Obama muddied the waters regarding possible military intervention. “The bottom line is that I have not taken any options off the table at this point,” Obama said. But his ambassador to NATO, Ivo Daalder, had already dismissed a no-fly zone, according to the Wall Street Journal. “The kinds of capabilities that are being used to attack the rebel forces and, indeed, the population, will be largely unaffected by a no-fly zone,” Daalder said. Even if efforts to launch a no-fly zone mission fail, Secretary of State Hillary Clinton is ready to aid the rebels. Clinton plans to meet with Libyan opposition leaders this week in Tunisia, and Donilon said Obama is looking for ways to aid the Libyan leader’s opponents, including providing arms. Let's hope Obama won’t arm the rebels with highly trafficable Stinger anti-aircraft missiles that could land in the hands of al-Qaeda or Mexican drug cartels. We are still paying a price for the weapons given the Afghan Taliban during its 1980s war with the former Soviet Union . Obama’s fifth message to Gaddafi is America’s response to the Libyan crisis depends on UN approval. Back in 1986, then-President Ronald Reagan took action against Gaddafi without asking for the UN’s permission. Reagan bombed Gaddafi’s Tripoli palaces in response to a Libyan terrorist attack at a Berlin discotheque that killed two and wounded 50 American soldiers. But Obama appears content to let the UN and other nations lead the search for solutions in Libya. He waited for a UN resolution on the embargo and now is waiting on a no-fly zone decision. His dependence on the UN isn’t becoming of the world’s sole superpower and certainly won’t help America’s credibility with anxious allies and adversaries such as Iran. For now, Tripoli remains under Gaddafi’s iron grip, which presents two choices. Either Obama works with our partners to replace Gaddafi, which could require force and lots of follow-up assistance, and risks seeing someone worse — an Islamist — rise to lead that nation, or we sit back and allow the Libyans to resolve the crisis themselves. Should Gaddafi survive this crisis, he could end up like Iraq’s former dictator Saddam Hussein after the 1991 Gulf War. Saddam was isolated, faced crippling embargoes that hurt the average Iraqi, and he returned to dangerous habits. Like Saddam, Gaddafi might renew his support for terrorists and restart his weapons-of-mass-destruction programs. During the 1970s and 1980s, Gaddafi armed terrorist groups, including the Abu Nidal organization, and used his agents to bomb Pan Am Flight 103 over Scotland. He also developed weapons of mass destruction — biological, and chemical, and he had a nuclear program — which he abandoned in 2004 because of threats from then-President George W. Bush. There is no guarantee Libya would be any better off if Gaddafi leaves, a risk Obama must take if he decides to intervene. But at least Team Obama should stop sending mixed and conflicted messages that damage our credibility and encourage Libya’s dictator.